Senate Bill 750 (Mendoza) English Language Education is finally on Governor Brown’s desk! He will determine the fate of SB 750 (Mendoza), to sign (and make law) or to veto. Mil gracias for your continued support of SB 750 (Mendoza) English Language Instruction!! 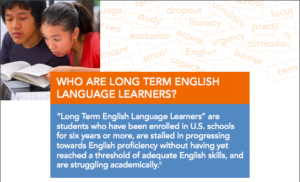 Written for educators, administrators, and policymakers, this booklet provides a research-based overview on the large number of Long Term English Learner students, who despite having been enrolled in United States schools for more then six years, are not progressing towards English proficiency but are continuing to struggle without the English skills needed. Laurie Olsen, Executive Board Member of Californians Together, discusses the results of recently released research on long-term English learners (LTELs) using data from 40 school districts and pilot efforts in dozens of schools. AB 2193 (Lara) Long Term English Learners, went into effect on January, 2013. This sponsored bill would define “long-term English learner” and “English learner at risk of becoming a long-term English learner” and would require the department to annually ascertain and provide to school districts and schools the number of pupils in each school district and school, as specified, who are, or are at risk of becoming, long-term English learners. Click to download the legislation. After more than 11 years in Los Angeles public schools, Dasha Cifuentes still isn’t speaking or writing English at grade level. The U.S. native, whose parents are Mexican immigrants, was raised in a Spanish-speaking household and she acknowledges that the two languages get confused in her mind. “I should be more confident in English because I was born here, but I’m embarrassed that I haven’t improved myself,” said Dasha, a junior at Fairfax High. Now, however, she and other students like her are receiving more attention under a new state law and initiatives by L.A. Unified and other school districts. The law requires the state to define and identify a “long-term English learner,” the first effort in the nation to do so. Click here to read more.